If you haven&apos;t yet heard Once Upon a Time in Shaolin, the final album by the Wu-Tang Clan, it&apos;s too late. Last night, the RZA exhibited the album for the first and last time in front of a crowd of about 150 art collectors, dealers, and critics (and four radio contest winners) in an outdoor dome adjacent to the MoMa PS1 in Queens. The Abott and producer Cilvaringz played 13 minutes of selections from the album and spoke to the crowd about plans to auction off the album to the highest bidder. But before the record could be heard, those hoping to even glimpse at the box had all electronic devices confiscated and were patted down by security to ensure no recordings could be made. The full project, described as a “time capsule,” contains 31 tracks and runs nearly two hours long. 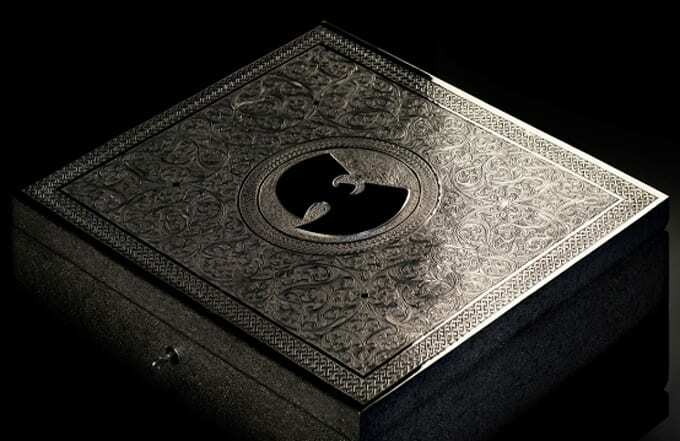 The record comes in a silver, jewel-encrusted box with a wax seal of the Wu-Tang logo and leather-bound liner notes. Due to its uniqueness and the fact that the only key is stored in a vault in Marrakesh, the one-of-one pressing was nearly lost forever when intercepted by an overzealous U.S. customs agent. The record starts out with ominous, foreboding production of heavy rains and several bursts of thunder, each louder than the last. Once the thunder cracks so loud it sounds like either the speakers or your eardrums could pop, the beat drops, and Raekwon spits the first bars. The production is rich, layered, and sonically bombastic and very much in the vein of the first two Wu albums. Despite the rugged, hard-hitting sound that smacks of ’93-‘97 RZA, it seems he’s actually deputized producer Cilvaringz to play beatsmith. RZA meanwhile has chosen to fall back and gives notes, acting as the album’s executive producer. All eight living members are said to be on the album, though Method Man didn’t seem to be featured in the selections played. There are features from longtime Wu affiliates like Killarmy, Redman, and most surprisingly Cher, who appears twice, as both singer and actress. As much as 80 percent of the record is said to be re-recorded, in an attempt to get the guys to spit with the same hunger and intensity they did in their prime. If you don’t make it, can you keep your half of the bread? The project sounds raw and rugged down to the mixing and mastering. The dusty yet crisp signature sound that evokes a fierce blade, both razor-sharp and rusted would feel very familiar to fans of vintage Wu-Tang. Lyrically the album also felt like a return to form. Two decades later, the MCs managed to channel the mid-&apos;90s Shaolin mindset, with the gritty storytelling and eclectic references fans know to expect. Two decades later, the MCs managed to channel the mid-&apos;90s Shaolin mindset. If anything, the problem might be that the formula was followed too closely. While the right balance of soul samples, movie dialog, and kung fu sound effects seemed to have been struck, it’s impossible to appraise whether it earned instant classic status after only hearing a less than generous 10 percent. Throughout the disjointed “highlight reel” of snippets, there were undoubtedly some gems, but there you also got the feeling that some of the deeper cuts might be better suited for a Wu-Tang mixtape, if such a thing ever existed. The crowd was largely still and silent throughout the entire stretch of music, clapping politely when that part of the evening concluded. The art world denizens seemed more attentive during the Q&A afterward, where Sasha Frere-Jones spoke with RZA and Cilvaringz. Even then, the only moments the art world patrons seemed to relish were when RZA would accidentally misspeak or pull a pop culture reference out of thin air. They went as far as to use soundalike beats, swapping them out at the last minute, for fear that one of the other Wu-Tang members might leak a portion. RZA claims his Wu brethren saw value in the project in the end, though it seems unlikely anyone but the project’s architects will see money on the backend. The idea that 100 percent of the Wu saw eye-to-eye on this is also dubious, given they participated under false pretenses and RZA’s apostles haven’t seen things eye-to-eye in nearly 20 years, it’s hard to imagine an art object with a starting price in the multi-million dollar range turning that all around. RZA and Cilvaringz seem genuine in their belief that this mythical “lost album” would solidify the legend of the Wu-Tang. RZA speculated offhand on one potential outcome, which is equal parts inspired and disheartening: “Maybe Richard Branson will just buy it and put it on one of his planes and send it to another planet. That’d be dope!” One’s left wondering whether the idea of artistic immortality or a multi-million dollar payout is the chief objective for the Abbott and his new apprentice. Matt “Raz” Rasmussen is a writer, culture vulture, and podcast producer for the Loud Speakers Network living in Brooklyn. Follow him @mattRAZ.